amino acid is called the genetic code. The start signal, or initiation codon, for translating the mRNA is usually specified by an AUG, which codes for the amino acid methionine. Three codons (UAA, UGA, and UAG) do not specify an amino acid. Instead, these codons serve as stop signals to indicate that the end of the gene has been reached. During the translation process, they signal that no further amino acids are to be assembled. The process of translation is carried out by ribosomes, which bind the mRNA and conduct a catalytic activity, called peptide bond formation, for joining the amino acids. The amino acids are carried to the ribosome by the tRNAs. Each tRNA has a specific amino acid attached to it and contains a nucleotide triplet called an anticodon. 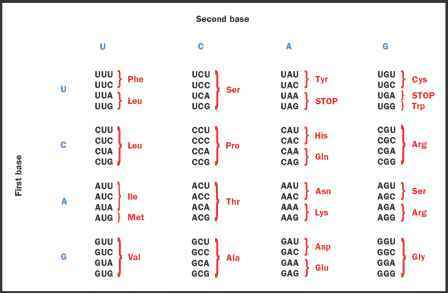 The anticodon recognizes a specific codon on the mRNA by pairing with it, using base-pairing rules like those used by DNA: A pairs with U and G pairs with C. For example, a tRNA with a UUU anticodon recognizes the AAA codon. The amino acid lysine is attached to this tRNA, so every time the ribosome "reads" an AAA codon, the lysine-bearing tRNA is brought in, base pairs via its anticodon to the codon, and delivers a lysine to the growing protein chain. Mutations arise when one or more bases in the DNA is changed. When the mutated DNA is transcribed, the resulting mRNA will carry the same mutation. Then, when the mRNA is translated, the amino acid sequence of the resulting protein will be different from the original, or wild-type, sequence because the codons affected by the mutation will recruit the wrong amino acids. The resulting mutant protein may have neutral, harmful, or even beneficial effects on the individual. These changes are the basis for evolution.